I was born and raised on the Island of Malta in June 1950 and spent my childhood and teenage years amongst my peers, family members and relatives - all within 20 minute’s drive of the suburb we lived in called Floriana. When I reflect back in time I realize what wonderful and important times they were for all the family members from both sides of my parents who lived within easy reach - 20 mins by car or 1 hour if you took one of the antique buses that operated on the island. Can you imagine a different colour for each village and town on the island, some 20 different colours. Our house was located on the Grand Harbour side of Floriana and had a sun-roof situated at the 4th floor of the house, where I spent most of the passing time watching military ships, cargo and cruise ships leaving or entering the Grand Harbour - a landscape that is probably one of the most painted places on earth. Even Turner left his mark on the art scene by producing a watercolour of this place. Whether he was there himself or a sketch was passed on to him by an illustrator is still debated today amongst art critics and collectors. The atmosphere was pure joy of clean air, sunshine for most of the year and blue turquoise sea - which along the way had a profound effect on my psyche, for even now I still include those colours in my palette and portfolio. All my peers and most of my family members were either in the British Military or attached to the Military - and under their watchful eyes I realized from a young age that being an artist was not something that would have been encouraged. Although some opportunities were available, the path of an artist was not taken seriously or encouraged. It seemed quite obvious that art was either for the elitist, or hobbyist. You must have a trade or a serious profession was always the echoed conversations with relatives and peers, voices I can still hear in my head today. However I had always questioned how can one not be influenced by art, bearing in mind the amount of Religious art and silver and gold craft that was on view daily, and still in abundance on the Island of Malta today. For Malta is an open air museum. The population is predominately Roman Catholic since St Paul was ship wrecked on the Island 2000 years ago and beyond that, clear evidence of thousands of years history. St Paul converted the population to Christianity and since, along the way over the centuries a church for every day of the year has been built. Yes, there is a saying in Malta that one could virtually attend Mass in a different church every day. 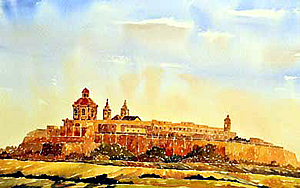 Eventually the richest military order of the World took over back in mid-1400 and enriched the Island with further Baroque art and places of worship, which left Malta a legacy of one of the finest history and the best art one could wish for. A magnificent example of this is the beautiful St Johns Cathedral - plain on the outside, but once inside you realize that the Knights of St John employed the best artists and craftsmen of the times. And this is also where the famous large canvas by Caravaggio ‘The Beheading of St John’ is accommodated. So, every day of my younger years I spent hours admiring the arts permanently fixed to the walls and ceilings of museums and churches, while perhaps I should have been paying attention to the Mass service. Later on in my teens I was apprenticed to British Leyland in the UK and my Engineering Career started as if by default, even though I was supposed to complete my short apprenticeship and return to the Island. In those days most Maltese teenagers enjoyed the same opportunities as most of the British kids because Malta was still a British Colony. The friendship that developed over the 200 years of historical connections had a profound effect on the Maltese people, hence my training placement to the UK. Along the way I was still drawing and trying to paint. The technical drawing of the engineering side was easy bearing in mind that art was a subject I would have loved to do, but not being given the opportunity to do Fine Art meant that I excelled at technical drawing. During the time I was in the UK I experienced training at AEC Truck and Bus Division and Scammell Motors. In 1970 I met my Mary Anne my wife from St Albans and in 1974 we got married - and with a family came responsibilities and a hunger for earning money to sustain a living. As I progressed through my engineering career and graduated as vehicle engineer and later on to Logistic Management I realized that once one is on the path of a profession your career is laid out ahead of you and very difficult to divert away from. However my dream to paint did not wane, and while I was employed in logistics I carried on my drawing and painting practice, enrolling on evening classes and joining art clubs and participating in art workshops and debates wherever I could. During all these years I still visited my family in Malta every year, with Mary Anne and the kids. We felt it was important for our children to know what their ancestral culture consisted off. After 30 years in Logistics and in my early 50s with a grown up family, I decided to do something for myself when presented with the prospect of redundancy due to company reorganisation. I volunteered for it, and enrolled at Northampton University as a mature student, and completed a Fine Art/History of art degree. I graduated in 2004 and that year I started my new job as a supply art teacher - and at last, I felt I had burnt my bridges with Logistics and embarked on a new path; the path of Art. I got involved as much as I possibly could in local art, participated in exhibitions, and Northants Open Studio. I also ran Northants Open Studios for five years with a team of local artist volunteers, in between trying to produce art for my portfolio. 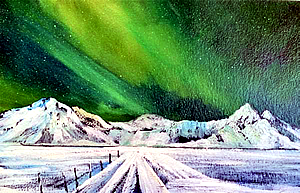 Along the way, and in between teaching assignments, I was still trying to find my artistic travelling soul - and back in early 2000 my first trip to the Arctic and into the unknown presented me with the challenge of the sublime landscape that was to become a part of my artistic journey. Equipped with a rucksack full of paints and paper I headed North for the first time to Norway, trekking and sailing on a coastal ship - and I was immediately mesmerised by Mother Nature. 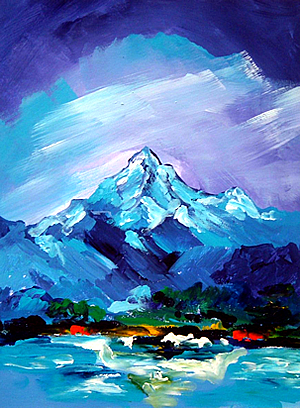 The more I saw, the more I wanted to see - for I realized that, although the weather didn’t always play in my favour, I was in the land of desolation and I had to push myself to my limits of contemporary art. Since that first trip I have visited the Arctic every year with the help of sponsorship and grant awards. I have fulfilled my dream and the artwork followed. The Inuits of Upernavik who I stayed with one Arctic summer have a saying: ‘Once you see the Arctic one becomes obsessed with it, for it truly is a special place' with its ice fjords, Northern lights, wild life and walking on one-mile-thick ice - plus the sight of helicopters and small boats, and sailing up the Norwegian coast, which I have now done a total four times, visiting every town along the coast. My mind was full of Mother Nature, and hopefully one day I shall collate these wonderful sights into one book - if not for the public, surely as a legacy for my family who come after me. The irony is that I had to wait 30 years for the dream to come to fruition, which brings to mind a saying by a Native American I also came across in my later years: ‘The future belongs to those who believe in the power of their dreams'. Since becoming fully involved and exposed to the Art world I have met many wonderful artists, colleagues, and students - too many to mention - who have inspired and helped me along the way to carry on the quest ‘in search of the picturesque’. For since that year of 2000 I have been very lucky with successfully completing many artist in residencies, commissions and projects which I enjoyed immensely and will treasure for the rest of my life. From the Sahara Trek to sailing the Norwegian coast several times, to temporally living and observing the Inuits of Greenland and sharing my art knowledge on cruise ships that have taken me from the UK to South America, the Far East and too many other countries to mention. 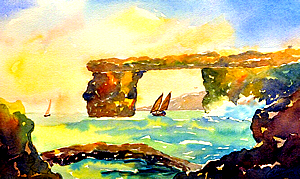 From the Island that gave me my birth place to the sublime and desolate landscapes of Greenland, Norway, Iceland, the warm and tropical landscape of South America, the Far East, the Mediterranean and of course the landscape and people of my adopted country Great Britain - these have all had an influence on my artistic journey. Whether in my sketchbook or my personality, they all have become a part of me. 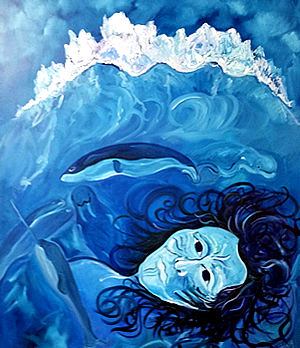 However the journey continues - for I believe that the journey of art never ends and I hope to continue with it till the day I can no longer lift a paint brush. 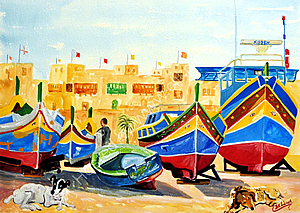 Presently, I am preparing for my next assignment, which is to take artists to Malta to paint 'plein air' for a week. HFHolidays' operations department does all the marketing and bookings on my behalf, and my task in return is to take their guests round the historical places of the Island to draw and paint its historical landmarks. ‘The journey continues’ - ‘He is truly wise who’s travelled far and knows the way of the World’ (Viking saying, 800 AD).